Nine perfectly good tracks that have a real bounce to them. FM albums are not normally known for being anything like buses, but here we were waiting years for one to come along and two arrive instead. 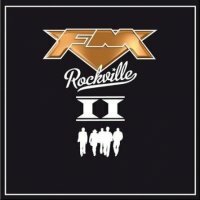 The main release of 'Rockville' has been covered elsewhere, and fans would definitely be forgiven for wondering if this, the 'sort of bonus but not really a bonus' album is just songs that weren't good enough for the main release. The thing is, FM always record too many songs, and since the early days have peppered their B-sides with tracks good enough for albums, from 'Love Lasts Forever' to the recent 'Rainbows End'. If any band can be relied upon not to rip off their fans with substandard material, it's these lads. So what we have here is an additional ten tracks to compliment your 'Rockville' album, although one of them is the short, but still cool instrumental 'Desolation Station' (the original title of the main album), so it's fairer to say there's nine tracks, really. To get straight to the point, it came as no surprise to me that all the tracks are of a quality to absolutely justify their release. The album kicks off with 'High', a bouncy track with a funky rhythm, followed by the crunchier 'Bad Addiction' and the cliché ridden, melodic-to-the-core 'Guilty'. There's nothing on here with the oomph of the other's 'Crosstown Train', although you do get a 'Runaway Train' instead, a nice, mid paced rocker with a cool guitar solo. I guess you can't have two 'train' songs on an album or something. The band rediscover an old cliché and declare they are 'Living For The Weekend' in a great, summery track, finally having a bit of a rest with this albums ballad, which comes in the shape of 'Forever & A Day', which, whilst not being one of their best, is a nice enough track with a cool little solo. 'Paradise Highway', 'Brother Take Me Home' and 'Last Chance Saloon' round off what is a very upbeat album that will be a pleasure to have around – if we ever get another summer. To be totally honest, the band definitely picked the absolute best few tracks for the first album, and as good as this is it hasn't, for me, got that killer top three that can compete with the likes of 'Tough Love', 'Crave' or 'Only Foolin'. With that said, it has nine perfectly good tracks that have a real bounce to them, continuing the former's mix of new and old style FM with style and panache. This is certainly not a tacked on money maker, and any track here would certainly have been at home on 'Rockville'. Who knows when this might happen again, so my advice is to enjoy this embarrassment of riches, music-wise, while you can.